This is a sponsored review from BlogHer and Ragú. While I've had the opportunity lately to do a few fun review posts, my husband recently asked me "How come you don't ever get to review stuff we already like? That would be fun." 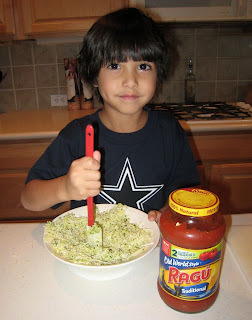 So when I got the email about the new Ragu campaign, I was rather excited to tell him "See, this is something we use!" We actually are pretty much exclusive users of the Ragu Traditional Pasta sauce. I don't make my own sauce, that's much more work than I like to do in the kitchen and we've always loved the flavor. We have Italian dishes probably once a week, I love a quick pasta meal because we're on the go so much--two kids with Brownies, martial arts and church classes means we're eating in the middle of many activities most nights. Needless to say, there are always a few jars in the house! A peek in my pantry, there's another open jar in the fridge too! Now, if you've been following along on my bento blog, you may very well have noticed that we are trying to limit HFCS. Thankfully (for all of us), we discovered that Ragu Traditional Sauce does NOT have HFCS in it! I really did not want to be searching for a new favorite pasta sauce. So, back to our taste test and what's new? The new Ragu Traditional has 2 servings of veggies in every half cup, versus 1 serving in the old formula, sounds great to me. I'm a big fan of extra veggies, no matter how we get them in. They suggested we do a side by side taste test. F&B were more than game for that, so I gave them each a spoon and we sampled. Per Faith (almost 8), "I can't taste the difference." As for Ben (age 5), "Does this mean we can have spaghetti tonight?" Two down, one comment and one starving boy. I recruited Shaun for the taste test as well. He wasn't game for the spoonfuls, so I handed him a zucchini parmesan muffin and told him to use it to mop up the sauce. Another vote for "it tastes the same," and, of all of us, he was going to be the one to figure it out. I tried it too, and one last vote for "just the same flavor!" We used a bit of Ragu traditional inside and served with a side of Ragu for dipping! We also decided to go ahead and try it with a few recipes--a simple spaghetti & meatball recipe for dinner and one of the kids' favorites, pizza biscuit cups for lunch. The recipes were both a hit, no one noticed anything different about the sauce and it was still just as yummy as ever. The spaghetti was perfect and the sauce was the right texture, texture being very important for me especially. The pizza biscuits are still a favorite, they even took a separate little container of Ragu Traditional to dip their biscuits in. 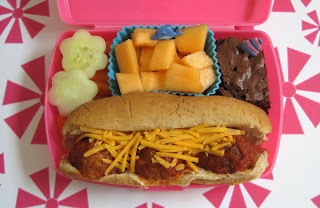 as meatball subs for bento lunches! Needless to say, we're all quite happy with the new Ragu Traditional. I'm always a bit apprehensive on "new & improved" when I already really like the old product, but I'm happy to say that there is no taste difference between the old and the new, and that the extra veggie serving is a great bonus. We'll still be buying it, frequently! I'll also be checking out the Ragu site some more too, lots of neat looking recipes for busy nights, and Lord knows we have those! There's a skillet pasta dish and a chicken parmesan one that are calling my name. BlogHer is also giving away a $100 Visa gift card to one lucky winner. Read the official rules for alternate form of entry. Visit the other BlogHer members to check out their reviews and enter their giveaways, official rules are here. Ragu is also offering a separate giveaway on their Facebook page, for a Meal Makeover Kit. Visit Ragu on Facebook to find out all the details. we like to get the frozen tilapias from fred meyer and fry it with some frozen vegetables. our favorite quick meal, which i think is healthy is tacos. we use locally raised beef and i make my own seasoning. yum! Pasta and sauce is always a quick and easy meal, and it sure sounds like the improved Ragu sauce makes it very healthy too. I make quickie casseroles with veggies, brown rice,eggs and a sprinkle of cheese. Salad and breaded fish works for our kids. My quick, easy and healthy dinner would be some chili. We just throw in the can of kidney beans, some tomato sauce,and meat and we have a dinner in less than half an hour. And it is delicious! My kiddos go crazy for homemade pizza. It's tasty and full of veggies...okay and smothered in cheese. With a three-year-old trying to climb the kitchen counters, nothing feels easy right now. ;-) But if I'm stuck for ideas, Little Girl loves a scrambled egg with minced fresh spinach mixed in. With some sweet potato stash from the freezer and maybe some whole wheat tortilla, she's pretty satisfied. We're having my quick and easy dinner tonight... Mommy's Pantry Chili. I toss beans, tomatoes and whatever veggies I have on hand in the crockpot with some spices and cook it on low all day. By the time we get home from work/school, the house smells amazing and we're ready to eat! My favorite quick meal is chicken fajitas with red pepper and oinion, all grilled on our indoor grill in under 10 minutes, add a can of low fat refried black beans on the side and we are done! Yummy and simple! Our favorite "Oh right, dinner.." meal is pan-frying some pre-cooked Lite turkey sausages, boil-in-bag brown rice and a bag of microwaveable steamed veggies(or 2) It takes less than 20 minutes and it's still got veggies and whole grains! Our favorite quick, easy, healthy dinner is to grill some chicken and veggies. We eat breakfast with a healthy omelet chocked full of veggies. We grill a lot, too. Your bento lunch was adorable! One of our quick meals is pizza. I make the crust and put on different toppings - traditional pizza, BBQ pizza, Italian Beef Pizza - well you get the idea. My boys love it also for pizza the next day! Put a salad with it and done - 30 minutes to the table! One of the favorite quick dinners is breakfast for dinner. Eggs are super quick and easy to make, so are pancakes! Spaghetti is fairly quick (jarred sauce), easy, and healthy (whole-wheat pasta). frozen tortellini and jarred marinara sauce. Strawberrie_S at yahoo dot com. May have a new favorite as of last week: steak au poivre (pepper steak), green salad with cherry tomatoes from the garden, and roasted beets from the garden. My fave healthy and yet quick busy dinner night meal is spaghetti with meat and veggie sauce. We love to use jarred pasta sauce and add meat and bell peppers. Yummy, fast, and healthy too! Oh, my fave quick and easy meal is Chicken and Spaghetti! chicken chile verde is my go to healthy meal. it's packed with vegetables and is really yummy! I love making spaghetti and we often make quick dinners of Ziti, yum! P.S. That lunch is too cute! I make spaghetti or tacos for a quick healthy meal. We usually have whole wheat thin pizza crusts on hand in the freezer -- both store bought or homemade. It makes it easy to top with yummy tomato sauce (or my favorite - pesto), a sprinkling of mozzarella, and heavy on the veggies -- green peppers, spinach, mushrooms. Pretty healthy for pizza! And definitely quick. One of our favorite quick/easy/healthy meals is spaghetti too. We've been buying the Hunts Chunky vegetable and blending it before using it (to minimize the veggie ugh factor from the kids), but might try this next, as I didn't realize it had HFCS. Thank you! Spaghetti and pasta sauce with mushrooms. My daughter loves it. Beef and broccoli is one of our favorite quick meals. I like to prepare a whole chicken in the crockpot then prepare veggies to go along with it for dinner. I love turkey chili with lots of black beans, corn, green chilis, and spicy chili sauce. Super quick, easy, and healthy! I have a super easy taco salad recipe made with ground turkey or chicken or beef. Add in some rotell, red beans, onions, garlic, salt, pepper, cumin, paprika, oregano and wahlah:) delish! We love grilled cheese, soup, and salad or carrots with dip. On my busy nights, I will brown some burger, crack open a jar of Ragu and throw it over some pasta for our dinner! It does not matter is if is a hurry night or not, we eat pasta almost every night and have for years. Love Spaghetti anything! I toss some whole wheat pasta with Olive oil, garlic, parm, and baby spinach. Sometimes I'll throw leftover chicken in it too. Baked chicken, microwave some fresh brocoli, and serve some rice a roni or similar on the side. I would have to say pasta with a chicken broth based sauce with some veggies thrown in. So good! My quick/easy/healthy dinner the other night was to throw down some dough on cookie sheets, top with Rago, pepperoni, cheese and tomatoes. In a 550 degree oven it only takes about 5 minutes to cook. 1 and a half packets chili powder from World Market. I usually grab one of the healthy family frozen meals of out the freezer. Chicken with vegetables, etc. Healthy, quick and very easy. I like beans and rice for a quick, easy, and healthy meal. Our favorite quick and easy (healthy) dinner is grilled salmon, with zuchinni and summer squash. Yum! Our family Love Ragu, my fav. is the Mama’s Special Garden Yummy veggies added in the sauce. Added with some ground beef and some shredded cheese!! We like manicotti for a quick meal...we could eat it every day of the week! Just stuff some manicotti shells with a ricotta/spinach mixture, put down some sauce on the bottom of your pan, then your shells, then more sauce, cover with foil and bake! Our quick healthy meal is tacos made with ground turkey, low fat refried beans and yellow rice. It's the kids favorite! My favorite healthy, quick meal is grilled teriyaki pork chops, rice & green beans! That is frozen pizza slices dipped into spaghetti sauce, with a glass of milk. I keep pre-cooked chicken and taco meat in the freezer so on busy nights I pull that out and heat it up. Quick and easy means pasta with meat sauce and a salad! Beef and veggies in the crock pot is the best busy night meal for us. A quick salad is good for my daughter and I. Now that it's Fall, a good stew simmering in the crock pot is a welcome meal. and, I'm able to use up the last of our fresh zucchini by slicing it and cooking just a little to drain off the excess liquid. Then, I pour a jar of Ragu' over the zucchini; sprinkle with cheese (mozzarella or a mixture of Parmesan & Romano are especially good). Bake just until cheese melts. Healthy & delicious! My favorite quick and easy meal is taco soup! For a quick dinner we will usually grill up some chicken and have a salad or veggie with it, quick and healthy. I read the official rules. Quesadilla's ~ Previously grilled and frozen chicken (reheated in microwave), flour tortilla's, cheese - and whatever else is around to put in them. Fast and easy. Everyone likes them too! At least once a week I fry up a pound of ground beef, add it to a jar of Ragu and serve it over Angel Hair. It is so quick and easy, yet fulfilling and comforting! Certainly a staple and a go to dinner at my house. When it's got to be quick and easy it's hot dogs wrapped in crescent rolls and I open up a can of pork 'n beans. Veggie/chicken sushi-roll is our go to meal. I like to throw together a Lady and Son's Chicken Casserole - yummy. 1 bag of deluxe stir fry veggies. 3 packages of Ramen noodles(ditch the seasoning packets) or you can sub wheat spaghetti noddles cut in half. I always keep a bag of premarinated chicken in our house because my family really enjoys this meal. However, you can throw the marinate in the bag with the chicken and leave it while waiting for the noodles to boil. Fry the marinated chicken. Add a bag of deluxe stir fry veggies after chicken is cooked. Add chicken and veggies to drained noodles. It really is a super easy meal. I make a hamburger vegetable soup that I throw in my crock pot on busy nights. Perfect for when you know you won't have time to cook dinner later, and it's healthy too! I make tons of cannelini bean, tomato, spinach over whole wheat pasta. The best way is to make it in a crockpot the night before…then turn it on before you leave for the day…and when you come home…nice fresh hot dinner is waiting!!! I do this with my vegan chili and its healthy organic and easy! My easiest healthy dinner is boil any pasta and toss with any Ragu, a can of petite diced tomatoes and sprinkle with cheese. Dinner in 15 minutes and healthy! Also, just want to say, your creative Bento lunches make me smile, you are my packed lunch inspiration and hero!! My quick n easy "go to" dinner would have to be spagetti and garlic bread. Add a salad and it's even healthier. It's easy & filling! We all like Salad, so if the kids both have to work, or have school activities in the evening, we will eat a big salad with pre-cooked chicken on it. I like to make a roast in the crockpot and let it cook all day and then just add potatoes and carrots in the last hour. Spaghetti. Not the most original dish, but I have a picky preschooler and husband, and I am a vegetarian. Everyone can agree on pasta! Our quick and healthy meal is pasta, pasta sauce, and a steamed veggie! whole wheat rice, grilled chicken with brocolli & cheese!!! kids love it... it's about the only healthy meal all my kids will eat :-/ thankfully it's easy! If I'm short on meal-preparation time, the crockpot is my savior. I toss vegetables in with chicken, beef, pork--whatever is on sale at the store that week. I saute a bunch of veg, toful, sesame seeds or cashews and some yakisoba with sauce that I make up as I go along - soy sauce, sesame oil, water, ponzu sauce, mirin, whatever. I like to cook ziti or rigatoni,pour on a jar of sauce, and top it with mozzarella cheese. Then I pop it in the oven until the cheese melts. We stir up some stir fry on those busy nights! We love to do "build your own" stromboli night! Spagetti is a quick and easy one for us. Can whip it up in 20 minutes and chomp it down in 10. nom. Skinless, boneless chicken breast, alfredo sauce and fettucini. With broccoli of course! We make pasta (with traditional Ragu), steamed green beans, and some strawberries or peas. I cook ground meat and chicken, and put in the freezer, so all I have to do is pull one out and add a couple of jars of Ragu, and start the water boiling for angel hair spaghetti, By the time I have fixed my salad the pasta is ready to go in the pot and when it is finished dinner is ready. My favorite pasta for busy nights is angel hair pasta with Ragu and a good Parmesan cheese. Thanks for the contest. Poor Man's Lasgna for when we are too busy for the real deal Lasgna. Pizza Sauce, shell noodles and any pizza toppings we have on hand (green peppers, mushrooms, pepperoni, cheese). Layer sauce noodles, toppings and cheese in casserole dish. Bake until bubbly. Yum! our quick dinner is definitely a salad. I just boil up a few eggs, chop up some deli meat, add some random leftover veggies, cheese, and croutons on top of the spinach. Sometimes I break up a few tortilla chips, to make it more filling. and we're also exclusive ragu people here! Our fave quick pasta dish is pizza casserole. Spaghetti sauce, cooked hamburger meat, cooked noodles, cheese and pepperonis. Very yummy and Quick! I really kind of cheat on busy night dinners. We'll have cheese, fruit, yogurt, carrots, broccoli, celery sticks with peanut butter and raisins, some lunch meat rolled up, if I have it. We eat alot of quick meals like tacos and spegatti. We also buy frozen ravaoli and just pour Ragu over it. I am glad you cant tell the difference in taste anfd my daughter needs the extra veggies! I make lazy lasagna! I cook pasta and drain then in a lasagna pan I mix in ricotta, italian seasoning, grated parmesan and green pepper and mushroom ragu sauce. Top with shredded mozz and bake. WAY easier than making it the traditional way and sooo good! Our favorite quick and easy dinner is a vegetable plate with raw tomatoes topped with some kind of cheese (we prefer fresh mozarella, but that is pricey), broccoli, and whatever other vegetables we need to use up. Our fave quick and easy, healthy dinner would be tacos. We use vegetarian *meat*, light sour cream, homemade guacamole, homemade salsa and 2% cheese. Yum! One of our favorites that is quick and easy is homemade tacos - veggie or turkey with lots of fresh veggies on top. Wow, lots of great suggestions and family favorites! Good tips, ladies! We have three small eaters so I always have left over sauce, I have taken to freezing it in ice cube trays and thawing just enough for kid sized portions of pasta on those midweek frantic nights where it would be so much easier to just go through the drive-thru. Spaghetti squash + Ragu + Parmesean cheese= fast, easy, inexpensive, healthy and meatless dinner! Our go to quick easy and healthy meal is grilled cheese/veggie soup or homemade raspberry vanilla pancakes and scrambled cheese eggs. #144 That is a great suggestion. I will have to try it. Anyway, for us, spaghetti and marinara sauce, with garlic bread on the side, is what we usually have for a quick and healthy meal. I love Ragu pasta sauce! For something quick, healthy, and cheap, I like to make fritattas. Eggs, ham or zucchini, hash brown potatoes, and onions. Pasta and Ragu sauce is a quick meal. I am following, liking, and subscribing. Thank you. Crock pot vegetable beef soup is a favorite. We load it up with a ton of veggies and make enough to have leftovers for lunch the next day. Ragu Traditional sauce is all I have ever used, and the only sauce my family will eat. For a quick and healthy meal, I cut a spaghetti squash in half and pop it into a 375 degree oven to bake about 30 minutes. While its baking I brown a pound of grass fed ground beef, then add a jar of Ragu Traditional sauce. When the squash is done I scrape the squash with a fork to break up the strands. We now have squash speghetti that I serve with the Ragu sauce. For a quick, healthy meal I boil pasta, then add chopped broccoli during the last 5 minutes and top it with grated cheese. We cook in bulk and freeze family-size servings. Then when we are in a hurry, we pop the frozen meals in the microwave, and while it’s warming, make up a salad to serve too. Sure is a time saver. I love to toss together chicken strips, salad dressing and bread crumbs to make homemade chicken nuggets. I grind up chicken and freeze it when it's on sale. I replace ground beef with ground chicken in chili. I don't really have a recipe - I throw a can of tomatoes, a pound of ground chicken, some garlic, onions, and lots of chili powder, into a crockpot in the morning, and we have it for dinner with a salad. I boil some whole pasta and pour some Ragu sauce over it. My favorite quick, healthy meal is a huge salad!!! Our quick and easy healthy meal is Turkey bacon BLT, salad and fruit. It just takes a few minutes to cook the bacon in the oven, chop up some lettuce and DONE! I saute onions and garlic,add Italian sausage,brown it, then add uncooked pasta along with the Ragu sauce...cover and let simmer till the pasta is cooked..and there you have it..add a salad and maybe garlic bread...couldn't be easier! Add some shredded mozzarella when it is done.